So this is what phones are going to be like in the future? That's a damn shame because this phone isn't that impressive. Nokia recently held a little competition with students at Central Saint Martins College of Art and Design. They challenged students to design a phone for the year 2015. The winner received a cash prize and an opportunity to work with Nokia on a summer placement program at the Nokia design studio near London. Daniel Meyer won the competition with this phone that utilizes the up and coming video conferencing technologies of phones. 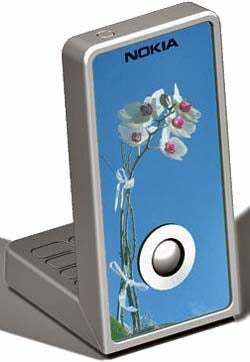 It seems to be a candybar style phone that rotates to become something of a picture from for general purposes and video conferencing. I at least hope that the integrated camera is at least 10 megapixels. This and some of the other entries can be seen at the Future of Mobile Design Exhibition in London for the rest of the week.